Afghan President Ashraf Ghani speaks during a U.N. conference on Afghanistan, Nov. 28, 2018, at U.N. offices in Geneva, Switzerland. Afghan President Ashraf Ghani said Wednesday that he had put together a team of diplomats and experts for prospective peace talks with the Taliban. Ghani spoke at a U.N.-sponsored conference in Geneva that was focused on ending 17 years of conflict with the rebel group, which did not attend the gathering. The two-day conference shifted its focus from Afghanistan's development and reform agenda to the quest for peace. 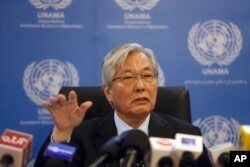 U.N. Special Representative for Afghanistan Tadamichi Yamamoto said that according to delegates, the country has little hope of achieving its goals of stability, security and prosperity without peace. FILE - Tadamichi Yamamoto, U.N. special representative for Afghanistan, speaks during a press conference in Kabul, Afghanistan, May 15, 2018. "Perhaps this is the first ministerial meeting when the issue of peace has been taken up with so much weight in addition to the regular issues, which are development, growth, social issues and reforms," he said. Yamamoto said the international community had agreed to keep helping Afghanistan now and to continue aid after a peace agreement was reached. Delegates at the conference were putting the final touches on a comprehensive document of support as a car bomb struck a British security compound in the Afghan capital, Kabul. Afghan National Security Adviser Hamdullah Mohib said events such as this bolstered his people's resolve for peace. "There is consensus within Afghanistan and outside of Afghanistan that the time for peace is now,” Mohib said. “We cannot squander this opportunity. It must be handled with patient focus and with a realistic understanding that it will take time to make sure peace is achieved and then implemented in a sustainable manner." Mohib said his government was ready to engage in serious, constructive peace talks with the Taliban. He said it was time for the Taliban to talk to the Afghan government, not just Washington. While he appreciated the international support, Mohib said the peace process must be Afghan-led and Afghan-owned for it to work.